Anthony Bourdain's gotten to eat with some pretty famous people in his time. Like, say, President Obama. But now he wants to take on one of today's biggest political players: Donald Trump. Fresh off his $6 meal with Obama, Bourdain was asked by the New York Daily News which current presidential candidate he'd most like to dine with, and the answer was strongly worded. "Trump. But for all the wrong reasons. I'd like to see him struggle with chopsticks and eat a well done f---ing steak." 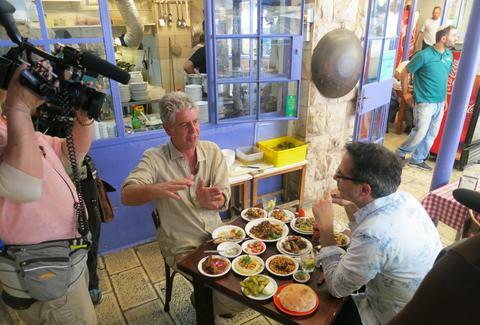 Basically, Bourdain just wants to eat with the guy so he can make fun of him. Also, to put that statement in context, this is right after he said that Obama was a regular with chopsticks, meaning Bourdain expects that Trump ain't got nothing on the sitting president when it comes to being cultured. However, after that initial statement, Bourdain toned down the negativity a bit, and went on to comment on Trump as a fellow New Yorker. "We've seen this guy for 30 years — how he treats people, what he says and what he does, how he does business every day. So he's one of ours. Yeah, I'd like to have lunch with that." That's about as close to a compliment as Bourdain's going to get when talking about the Donald, who he's frequently criticized. But most importantly, if this hypothetical lunch were to happen, what would they eat? Bourdain said he'd like to feed Trump steak tartare. Man, this lunch needs to happen. Kara King is a News Writer at Thrillist and is just OK with chopsticks. Send news tips to news@thrillist.com and follow her at @karatillie.